But we still remembered her on her birthday. We went to church at Duquesne, which is where we got married and where Adelyn's funeral was and where Coen got baptized. Feeling badly that Sierra seems left out here, but we never thought to have her baptized there (instead she was baptized at the church I grew up going to). Since Adelyn's birthday fell on a Sunday and being where her funeral was makes me feel close to her, we decided to go. Well, wouldn't you know we got there and there was a special mass honoring the priest who married us, performed Adelyn's funeral and baptized Coen? He was being honored for 40 years in the priesthood. On Adelyn's birthday. Think what you want, but I take it as a sign from Adelyn. It was pretty neat. The #3 candle is the same one we used on Sierra's 3rd birthday. I rinsed it off and saved it for Coen's next year. If only Coen hadn't spit milk and got food all over his "Adelyn's little brother" shirt, this probably would have been a new favorite picture! We released 3 lanterns for her and it was so beautiful. Then we had cake and sang to her also. It was a pretty good day. Although I found myself feeling rather angry about halfway through it. Mostly because a few people didn't mention anything or say anything. I think that is what hurts the most, when people (especially those who had really been there for us previously) forget. It kills me, like she is forgotten. So I did my work out to release some of my anger, and it helped. Even though there were some who did not say anything this year, there were still plenty who did. I try to tell myself we are blessed with some amazing friends and family and to overlook the people who forgot. But it's hard. This year was definitely better than last year. That's not to say I wasn't sad, I didn't feel that sinking grief feeling in my stomach, didn't miss her like crazy. Oh I did. I guess I just managed it better. I cried, I got angry, I honored her the best way I could. I wasn't able to look through her memory box, it's been at least a year since I have. I don't know what but I just can't. I know if I do, the pain will come and I just can't go there, even though I probably need to. Happy Birthday precious daughter. 3 years closer to holding you again. Happy birthday Adelyn. Love to all of you. Beautiful lisa. Beautiful. You are beautiful. Grace. As Stella's birthday approaches I'm not sure how I will,carry through. I'm wondering if you could contact me on my personal email or my work email. 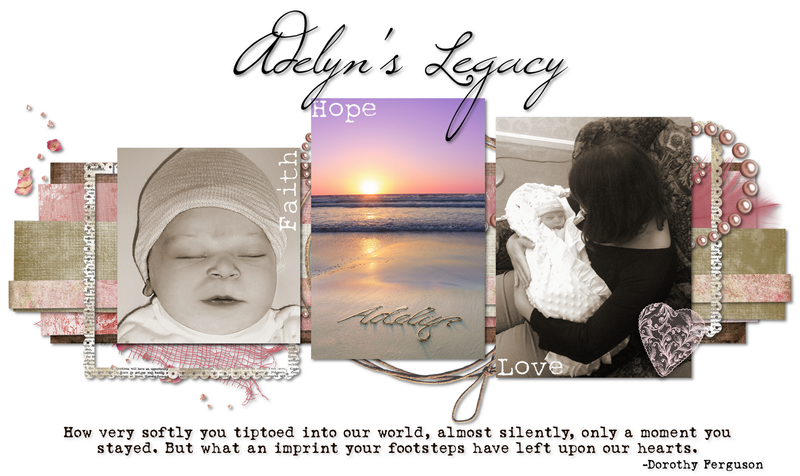 I'd love to have you do a critique on one of our keepsakes in memory of Adelyn. I can be reached at hallie@jewelrykeepsakes.com or hallieschumaker@gmail.com. Best to you and keeping you in my prayers! Please do not hesitate to reach out to me if you have any interest in a keepsake remembrance of Adelyn. What I've found stumbling into year three. I am a mother of three beautifully unique children. Our oldest daughter Sierra, our middle daughter Adelyn who inspired this blog, and our youngest son Coen, our rainbow baby. I have a wonderful husband and family. Most days I love my job. This blog is my way of sharing my feelings to those who want to read them. It is also my place to remember and be with Adelyn.